Alpha-lipoic acid is a sulfur-containing fatty acid that performs vitamin-like roles in the body but since the body produces lipoic-acid on its own, it is not classified as a true vitamin. It functions as a co-enzyme in the metabolism of carbohydrates and is required for synthesis of acetyl CoA, a key metabolite in the cellular process that turns glucose (blood sugar) into energy. Stabilized R-Lipoic Acid contains BioEnhanced® Na-RLA, the sodium salt of R-Lipoic acid. Pure R-Lipoic acid is a very unstable molecule that has a tendency to polymerize with exposure to heat, light, and moisture. BioEnhanced® Na-RLA is a stabilized form of R-Lipoic acid that won’t degrade at high temperatures. Lipoic acid is a key factor in the cellular process that metabolizes glucose for energy production. Aging is accompanied by a decreased ability of the liver to recycle ascorbic acid following oxidative stress. R-lipoic acid, has been shown after two weeks of supplementation to aged rats, to reverse the age-related impairment of ascorbic acid recycling and concentration in liver cells. Aging is also associated with oxidative stress in the brain. The brain's high rate of metabolism and its long-lived neurons make it particularly vulnerable to oxidative stress. Since lipoic-acid interrupts cellular oxidative processes in both its oxidized and reduced forms, it plays a modulatory role in the brain and nervous system. 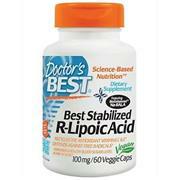 Why should I take Doctor’s Best Stabilized R-Lipoic-Acid? An ideal antioxidant would have the ability to quench a wide variety of free radicals, to support the functioning of other antioxidants, to bind or “chelate” metal ions that can generate free radicals, to function in watery and fatty environments and to be present in a variety of tissues, cells, and extracellular spaces. Lipoic-acid meets all of these criteria and is often termed as “the universal antioxidant.” As we age, our ability to synthesize alpha-lipoic acid decreases. Age also brings an accumulation of oxidized proteins that interfere with mitochondrial efficiency and Alpha-lipoic acid addresses this situation. All payments are processed via Sage Pay. Sage Pay is a Level 1 PCI DSS compliant Payment Service Provider processing millions of secure payments each month for over 30,000 businesses. All transaction information passed between this site and Sage Pay’s systems is encrypted using 128-bit SSL certificates. No cardholder information is ever passed unencrypted.